Before entering the seminary, I never knew there were different Eucharistic Prayers. The Eucharistic Prayer is that part of the Mass that goes from the time when the people kneel after the “Holy, Holy, Holy” (the Sanctus) to the Our Father. Before the 2nd Vatican Council, there was only one Eucharistic Prayer (typically referred to as the “Roman Canon”). 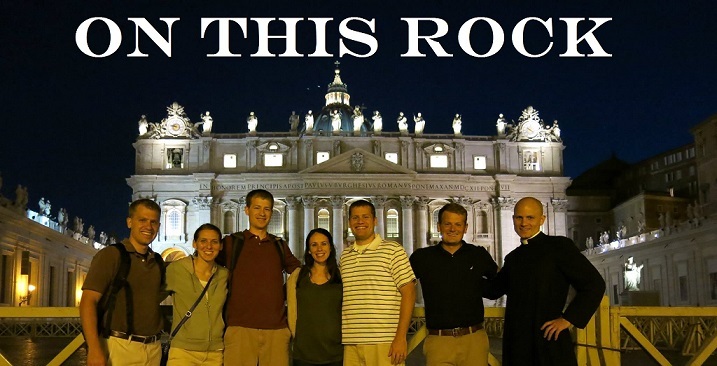 Now, the “Roman Canon” is more typically referred to as “Eucharistic Prayer I” because the 2nd Vatican Council added 3 other options (Eucharistic Prayer 2, 3, and 4) along with several Eucharistic Prayers for “reconciliation” and another couple for Masses with children. At a typical Sunday Mass, you will usually hear either Eucharistic Prayer 1, 2, or 3. 1 (the old one) is typically used on big days, 3 is used a lot on Sundays, and 2 is used at most daily Masses because it is the shortest. There is no rule on when to use which prayer (Eucharistic Prayer 2 can be prayed Easter morning if the priest so chooses) but the above breakdown seems to be the usual pattern most priests go by. I have a personal love for Eucharistic Prayer 1, and probably use it more than the average priest. My love for Eucharistic Prayer 1 stems from many reasons, and I’d like to share those. 2. There is a part in Eucharistic Prayer 1 where the priest bows down and says “Almighty God, we pray that your angel may take this sacrifice to your altar in heaven. Then, as we receive from this altar the sacred body and blood of your Son, let us be filled with every grace and blessing.” I love it that it is referred to as “an altar” but no mention is made of it being a table! 3. Another element unique to Eucharistic Prayer 1 is the mentioning of all the saints. The first round of saints mentions the apostles, and the second part of the first group are some saints from the early Church of Rome, including some of the first Popes. The 2nd group of saints are all martyrs, 7 men and 7 women from the early Church. The saying of these saints can be omitted if the priest chooses, and sometimes I choose this option if I feel like it might distract from the larger celebration going on, but I definitely include it if the Mass is a celebration for any of the saints listed in either group. I also love the fact that it is a nice rejoinder to all those who say the Church hates women – just as many women are present in the second group as men. Also, when rattling the names off, I am reminded of how we are completely surrounded by amazingly heroic people praying for us at all times. 4. I also like the reference in Eucharistic Prayer 1 to “Your priest Melchisedek.” Melchisedek is not actually an Old Covenant priest, he is simply a man who fed Abraham in the Book of Genesis, and was motivated by charity. It is a good reminder that a priest is defined by his office AND by his charity. All Catholics would do well to look over the three most common Eucharistic Prayers; my love for the Mass has only deepened as I have had more direct contact with the words of the prayers of the Mass. In fact, praying over the prayers of the Eucharistic Prayers would make a fantastic “mini-retreat” for busy lay people and priests alike. Homily from the Feast of the Holy Family - what does the Church say about families? Today, the 4th day of Christmas, the Church remembers the Holy Innocents, those children slaughtered by Herod in an attempt to eliminate the Christ child. 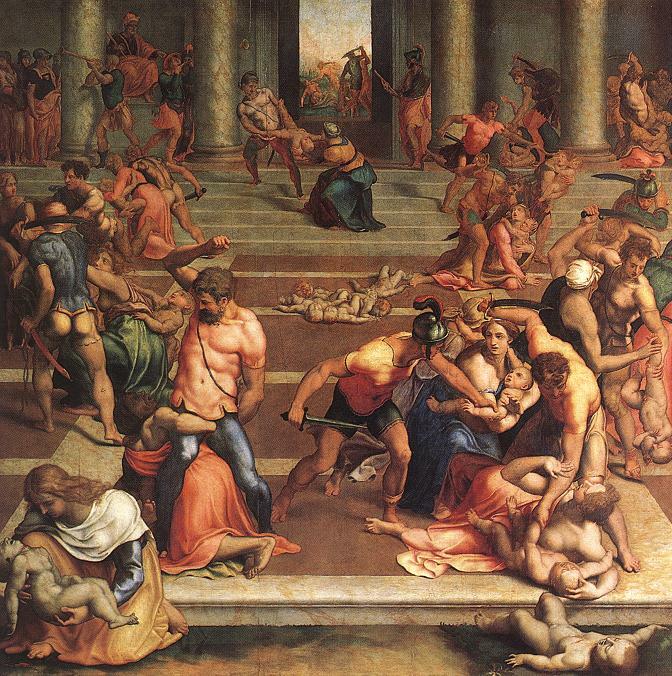 Interestingly, it was fear that motivated Herod to authorize a wide-scale slaughtering of children; it seems the same motivation is often in play with the decision to abort a child. Herod feared what the little child would take away from him, just as today people fear what the unborn child will take from them if allowed to live. Fear today is often at play on two different levels, the governmental level and the individual mother's level. The government, on behalf of some of the people, allows abortion because it is said many places that we are running out of resources, and need to eliminate the "excess population" as Dickens so succinctly said it through the mouth of Ebeneezer Scrooge. Fear is at the heart of the decision to allow abortions in our land, fear of what the children will take from us, and we need to first of all admit and own the fear, and then we must ask if it is warranted. We have long realized that the idea that we will run out of resources is a fraud, but people still choose to perpetuate the myth and the fear train pushes forward. For the individual mother as well fear is often a strong motivating factor in the decision to abort. Fear of an inability to care for the child, fear of not being able to do what one wants anymore, etc. The mother, like Herod, fears what the child will take away from her. May we spread the word to our society that we have nothing to fear but fear itself, may we reach out to struggling mothers in need to show them they need not be afraid with us around to help, and may we pray that the scourge of abortion may one day cease throughout the world. Questions are often put to Christians today about the effectiveness of what happened in Bethlehem, whether what we celebrate tonight has any real fruit to show for itself. Many will ask Christians “aren’t we still the same people before and after Christ?” Aren’t we still haunted by famine and war and violence and poverty and pride? Some people will even grant us the notion of sin, only to say that it doesn’t look like Christ has done a whole lot about it. This line of questioning, whether one is Christian or not, is a display of the arrogance of our times – assuming we know what life must have been like in all other times prior to our own. People today often subconsciously assume that they know what it was like to live 2,000 years ago, that they know what it was like to be a human being 2,012 years ago, when in fact we DON’T know what it was like. We don’t have the slightest bit of personal data about what it was like to live without Christ or His Church. We don’t know, and just because the drama goes on seemingly unaltered to the skeptical eye does not mean that the story of humanity did not experience a seismic shift in Bethlehem. The people who walked in darkness have seen a great light – when we read the Scriptures we see that darkness covered the land of our ancestors who inhabited that part of the time line known as B.C. There was no way to personal redemption and people knew it. The Scriptures speak over and over again about how the Jewish nation could only retreat further and further into a slavish following of the law of their fathers, but no release was to be found. Animals were slaughtered in the temple continuously such that blood flowed from the temple, but all knew it was not enough. The people indeed walked in darkness – they knew they were lost but they could not save themselves from themselves. The people who walked in darkness have seen a great light. We don’t experience the birth of Christ as a seismic shift, we don’t experience the birth of Christ as a turning of the world upside down because it is all we know. We were born in the era of the light and so the darkness that our ancestors stumbled in is completely foreign to us. Thanks be to God that we only know life where Christ has come. It is not enough, though, to be born in the era of Christ the light, it is no credit to us that our birthday happens to have an A.D. on the end – if all we do is see the light but do not act on it, do not draw near to it, do not yearn for it, do not consume the light and allow ourselves to be lit up from the inside like fireflies then the day will come when we will wail in agony, first and foremost because we forsook such a prize. If the light scares us and we keep our distance, we will walk in darkness because Christ the true light is not something to be studied, He is not a painting in the Louve, he is not a masterpiece to be gawked at and admired from afar, he is to be internalized and consumed. Now at this Mass invisibly, but one day soon for all to see, the curtain of heaven will be drawn back and the choirs will be heard again saying Glory to God in the Highest. Let us not gawk at Christ but invite him in to our lives this night and always. If interested, see the text in the previous blog entry. Tonight’s Gospel is often skipped over on Christmas because it is assumed that the people will fall asleep somewhere between Perez and Shealtiel. Besides, St. Paul, in the 2nd reading gives a much shorter explanation of history – he stands up and says “here is the history of things leading up to Christ – Slavery in Egypt then Saul then David then John the Baptist and then we get to Jesus! Some might ask, “If we just used Paul’s version we’d be 10 minutes closer to Christmas Eve dinner at this point. So why the list? Why the 47 name long genealogy of Jesus? It is first of all important to realize that this is the beginning of Matthew’s Gospel – and no writer starts out their story with something insignificant. The problem for us is this – these names mean little to nothing. To those reading Matthew’s Gospel, though, this list was hugely significant. These names were the heroes and villains, the saints and sinners of the Old Testament. There was no tsunami of pop culture like we have today, no TV, no internet, no movies no books. Jehosaphat and Isaac and Jacob and David were, to the people reading and hearing St. Matthew’s Gospel, the equivalent to Harry Potter, Lebron James, and the John F. Kennedies of our day. The names in the genealogy we just heard would have conjured up images and stories of human triumph and failure, of simplicity and pride and humility. The Old Testament to St. Matthew’s readers WAS the popular culture, it WAS their entertainment. It WAS the stories that they viewed their own stories through. First of all, then, a quick sidebar, I’d like to challenge us to something – this year let us learn the stories of these men and women mentioned in the genealogy of Jesus. Let us crack open the Old Testament and familiarize ourselves with the stories of these men and women. In the dawn of Christianity some came forward and said the Old Testament could be discarded ---- that theory was quickly labeled and is still considered a heresy. The stories of the Old Testament are our stories as well and this genealogy comes alive with drama and passion if we know the people behind the names. When next Christmas Eve comes, may we be familiar with the cast of characters that we heard moments ago. What we should take away from this genealogy is that some were kings, some were adulterers, and some were farmers, the list includes virtue, murder, slavery, hope, victory, defeat – the story of the 47 names listed in the genealogy of Jesus is the story of human history – the good the bad and the ugly. Their stories are our stories – what we need to know is that these people were not angelic, passionless, stoic stock characters, and neither are we. Christ came from them and for them. In the same way, no matter our state in life, Christ came for us too. He came for us and he came for you. He came for you. Do not let your sins excuse you any longer from the drama of this faith, do not think that your sinfulness is found nowhere else in history, do not lie to yourself and think that God may love some people but he surely couldn’t have come for you, to save you. See in these men and women of this genealogy yourself, and come face to face with the reality that Christ came for you – and then do something about it. To listen to some psychologists today (and some Catholics), Santa Claus is something that must be done away with. It seems to be taken for granted by those who take this line of reasoning that talking about Santa Claus is a lie and that it causes inevitable psychological damage when children find out that Santa Claus is not, in fact, a real person. Santa also receives the lion's share of the blame for the consumerism that has crept into Christmas. Recently, Santa suffered another serious PR hit from an Archbishop in South America who said Santa should be eradicated from our consciousness and that he has nothing to do with the actual celebration of the birth of Christ. A Catholic who would disagree with all of this is none other than J.R.R. Tolkien, author of the Lord of the Rings Trilogy and the Hobbit. 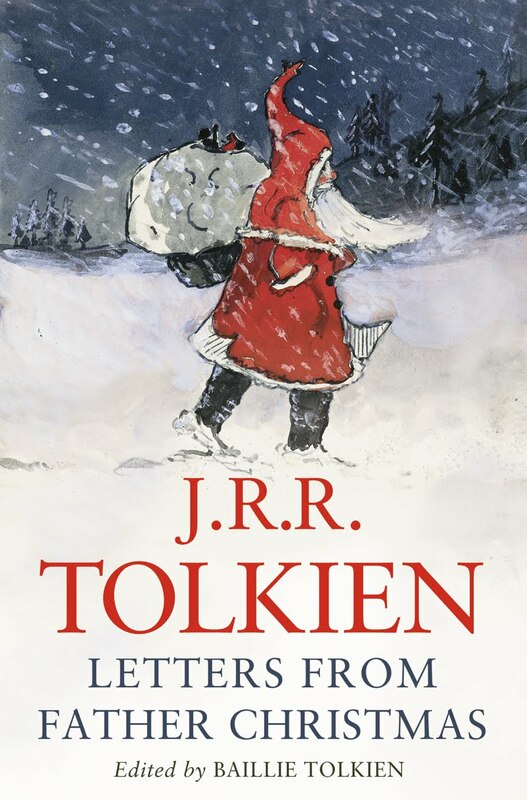 One of Tolkien's lesser known works is called Letters from Father Christmas. It is a collection of letters that Tolkien wrote through the years to his children. Tolkien invented a special font that he used for all of his letters originating from the North Pole, and many of the letters feature Tolkien's beautiful hand-drawn images of Santa, his elves, the reindeer, etc. 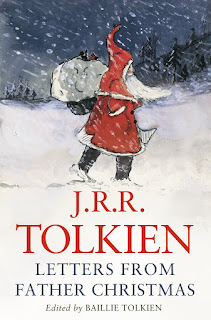 Tolkien didn't just leave a note on Christmas morning either, there is a month or so of correspondence with his children each year in the lead up to the big day. Some Catholics would probably argue here that Tolkien is not infallible, and indeed he is not. However, I think it is good to look at another writing by Tolkien, an essay he wrote titled "On Fairy Stories" (click here to read the essay). The essay, in my opinion, is Tolkien's most important work. It is an amazing discussion about the genre that he so expertly worked in, and he weaves in his Catholicism and a profound discussion about modernism and imagination as well. Tolkien does the best job I've ever seen of laying out what exactly the elusive but important phrase "the Catholic imagination" means with his essay. "Fantasy is a natural human activity. It certainly does not destroy or even insult Reason; and it does not either blunt the appetite for, nor obscure the perception of, scientific verity. On the contrary. The keener and the clearer is the reason, the better fantasy will it make. If men were ever in a state in which they did not want to know or could not perceive truth (facts or evidence), then Fantasy would languish until they were cured." "The Evangelium [the Gospel]has not abrogated legends; it has hallowed them." What Catholics need to ask themselves is whether or not the fairy story of Santa teaches a deeper truth or not. Clearly Tolkien (a faithful Catholic who disdained the poisons of modernity) believed that fairy stories, myths, and things which feed the imagination are not signs of depravity or disease but are important in passing on the Truth. Maybe we should ask ourselves exactly how modern we're being when we think that a child's mind will be in some way poisoned by being allowed to think about reindeer, polar bears, elves, and a man who brings undeserved and ummerited gifts every year to celebrate the birth of Christ. As Jean Shephard, author of the famous movie "A Christmas Story" once wrote - "I was well into my twenties before I finally gave up on the Easter bunny, and I am not convinced that I am the richer for it." 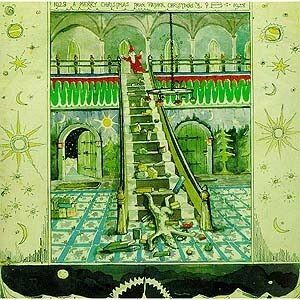 Along with Tolkien, I'm not convinced that Christmas (or life in general) must possess the scientific accuracy of Newtonian Physics, and in fact, I hold that life suffers and languishes precisely when we try to make all aspects of our lives and our feasts conform to that same slavish mathematically "real" accuracy. Our 7th grade theology teacher came to me this past week and asked if I'd be willing to bestow scapulars upon any of her seventh graders; she said they'd been talking about scapulars in class and that some of them were interested in enrolling. I was a little skeptical that any of them would actually want to do it, but I agreed to meet them in the chapel during homeroom to go through the ceremony. The word scapular first referred (and still does today) to a cloth that hung the length of the body, front and back, and would drape over the shoulders of monks and religious sisters. This scapular originally had a use - it kept the underlying habit clean when one was working. The scapular essentially served as a two-sided apron. Today, many religious orders still feature a scapular as part of their clothing. Now, it is typically more often used to signify the promise of Christ - "My yoke is easy and my burden light." The scapular takes the shape of a yoke around one's neck, but, being made of cloth, is obviously quite light on one's shoulders. The scapular has also come to refer to a smaller version as well, and is usually more like a necklace than an apron. There are many different types of scapulars that can be worn, and each is usually associated with some special devotion to Our Lady. 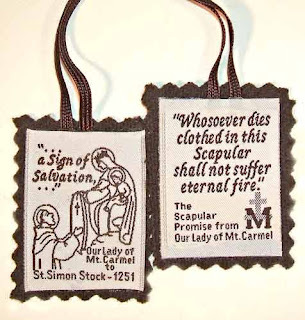 The most popular of these scapulars, by far, is the brown scapular which is the sign of a devotion to Our Lady of Mount Carmel. In the apparition associated with the Carmelite order, Mary promised that if those wearing a scapular kept their daily promises of praying (either from Scripture or the Rosary) then she would lead them in to Heaven. Criticism obviously arises from our modern world with regards to the Scapular, because some accuse its wearers of superstition and so forth. Certainly, to a world that is completely devoid of the supernatural, the scapular takes its place in a long line of Catholic Hocus Pocus. However, if one sees the scapular for what it is, a pledge by the wearer to conform their life to Christ and to pray daily, the idea that those promises would lead to eternal life is not that far-fetched. Anyways, after explaining to the 7th graders in the chapel the various serious promises that a scapular-wearer makes to pray daily and to live a life of holiness, I asked all who were interested to come up and take a scapular and place it on the altar. I was shocked, because all but about 5-10 kids came up and took one! It was very moving for me to see the young kids so interested, even after hearing what all they were promising. I've been meaning to have a priest bestow a scapular on me for many years. I've been living the promises for about 10 years, but I've just never gotten around to actually wearing the scapular because I can never find a priest to do the ceremony for me when I'm thinking of it. The 7th graders were my inspiration, and yesterday I had my spiritual director bestow a scapular upon me. From the mouth of babes! All were conceived without original sin - so what is the difference? I have two posts I'd like to do soon on issues stemming from what I consider to be a terrible Catholic magazine. This is the first. A) NOWHERE does Catholic social teaching even start to talk about tax rates or anything approaching such minute details of governance. I am teaching Catholic Social Teaching to seniors right now, and the Church's clarity, breadth, and guidance are stunning to behold and examine; for me it has been a great class to teach these past two years. The Church talks about many broad issues concerning how countries and nations ought to govern, how workers are to be treated, when war is acceptable, how companies and governments can get too big, the importance of families, the right to life, etc. But to say that anything from the Church has ever even come close to hinting at the morality of tax decisions is completely false. B) The people who write U.S. Catholic don't typically give one ounce of credence to what the Church teaches about anything else, yet here they are trying to use the respect that some have for the Magisterium (the same Magisterium that the magazine typically attempts to undercut) to pass off a complete lie as coming from that Magisterium simply to further their own agenda. At this point I am reminded about something from the Gospels about wolves in sheep's clothing. 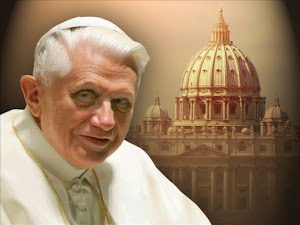 The fact is that "Catholic Social Teaching" is very often lied about, misrepresented, and abused by people who otherwise hate the teaching aspect of the Church - often simply for the purpose of furthering their liberal political agendas. Interesting that when pro-lifers get involved in the political realm, dissenting "Catholics" accuse them of being one issue voters and politicizing religion. Maybe what pro-life Catholics need to do is borrow a page from U.S. Catholic and simply decide to make up Church teachings to justify their politics. If all three were immaculately conceived, why the difference in results? Working on fixing the scratchy audio!